Ask fellow campers about "Lake Billings RV Park and Campground" and nearby attractions. Rates are $24 for water and electric, $26 with sewer. All sites are grass back-ins with 30 amp electric only. Each electric post serves 4 sites, 2 - 30 amp outlets on each side of the post. The water hookup also serves 4 sites. So the water and electric connections are on the wrong side for about half of the sites here. Extra hoses and power cords could be needed. Some sites are level and others will require a lot of blocks to level. The campground here is part of a recreation complex and close enough to walk to town. The complex also has a beach, playground, pavilion, tennis courts, etc. So this would be a good place for people with kids. Verizon cell and broadband both very good. Wi-Fi was mostly good, but it did drop out for one of our two days here. TV via batwing was also pretty good. We camped at Lake Billings RV Park and Campground in a Motorhome. Manton is a small town, but it does have a couple of restaurants, two bars and a well stocked mini-market. The park staff is very friendly and eager to help with anything you may need. It's a Great clean park, with clean restrooms and showers. The lots are decent sized, and you don't feel crowded. The best part is the waterfront sites. They are reserved FAST, but they are amazing. The lake has decent fishing, and is good for swimming. We camped at Lake Billings RV Park and Campground in a Fifth Wheel. We've been camping here for years with a group. The staff is friendly and helpful. The main bathrooms and showers are clean. Some of the sites near the lake can be wet if there has been a lot of rain, but it's not usually an issue. We camped at Lake Billings RV Park and Campground in a Travel Trailer. 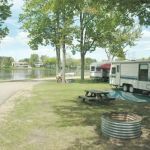 Are you affiliated with Lake Billings RV Park and Campground ?